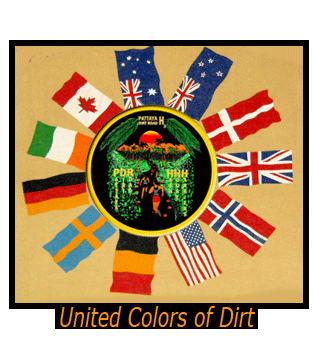 Pattaya Dirt Road H3 was founded in August 1985 by Bob "PIMP" Finch and Derek "DERELICK" Miller. The Runs: Take place normally on the last Thursday of every month. Only under very special circumstances are the run days changed. A non-refundable deposit of 2,000 Baht is required. Sign up with the Hares at least 10 days prior to the run date in order to guarantee a run shirt. Virgins can only be signed up by a Dirt Roader who has completed 5 PDRH3 Runs and who knows his virgin. The Hares cannot sign up virgins without a sponsor. It is the Hares responsibility to make sure the Sponsor meets the 5 PDRH3 Run requirement. Any breach of thisrequirement will feel the wrath of The Dirt Regulator and his famous way of dealing withthis sin. Virgins: A 10% rule applies up to a maximum of 4 virgins on any run where virgins are allowed. Virgins are not allowed on the January AGM run, the 10 year anniversary runs and the 100 anniversary runs. Virgins will be assessed at the Dirt meeting after the run as to whether or not they will be accepted as a dirt roader. If accepted they will be given their run shirt on their second run. Dirt Meetings are normally held on the first Thursday of each month at 5pm in the TQ. To sign up online contact: Pattaya Dirt Road Please enter "Dirt Road" as the subject.